Onchi began printmaking in 1914 and, for the five decades that followed, he was always at the forefront of the 'Sôsaku hanga' (Creative Print) movement, experimenting in new expressions, which resulted in his being the first artist to use abstract expression with 'Bright hours' (c.1915). Apart from prints, Onchi worked in photography, photogram, book design and three-dimensional objects. Subscription distribution of the series 'Eight impressions of modern women' by Sôsaku hanga kurabu (Creative Print Club) began in 1929 in two editions: the first was limited to 20 copies which were printed on 'Edogawa' paper by the artist, and signed by him; the second edition, from which this print comes, was limited to 200 copies which were printed on 'hôsho' paper under the artist's close supervision, and his name stamped (embossed). (See 'Onchi: A poet of colours and forms' [in Japanese], pg. 264.) The date 1933 in this print indicates that this impression was made in 1933. Asian Art Dept., AGNSW, 13 February 2002. Signed and dated u.r. 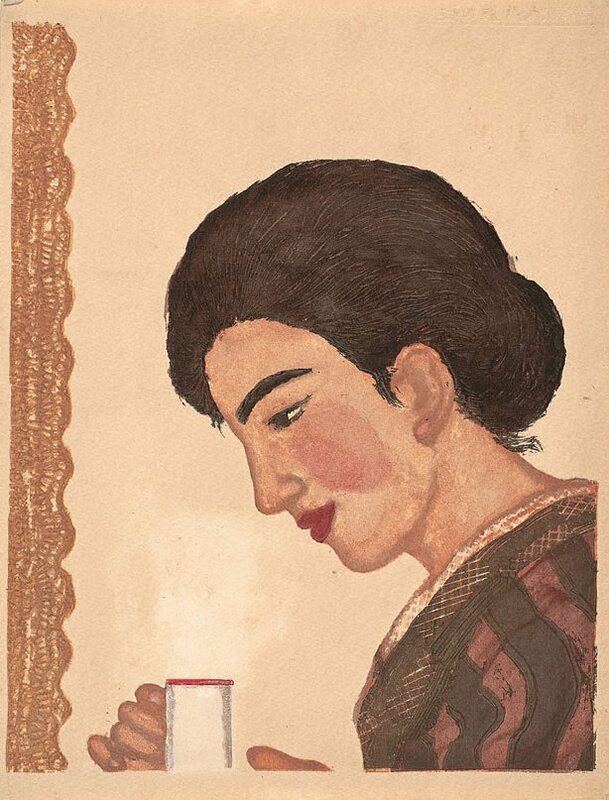 recto, in Japanese, embossed "(Kô) [from Kôshirô] 1933".